In addition to the open-ended question about people’s main news source, the survey also asked respondents a series of questions (including those about trust) about eight specific outlets in their country, allowing for a deeper understanding of how individuals feel about their news options. The eight specific news outlets for each country were identified in a way that aimed to be familiar to respondents. Therefore, in some cases, the eight outlets asked about are more specific publications or outlets within broader news organizations discussed in the main news source section. For example, in France the survey asked specifically about the television news channel France 2, which is part of the larger France Télévisions (France TV) family of channels. For each of the eight outlets, respondents were first asked if they had heard of the outlet, and if they had, they then were asked if they trusted or distrusted it. In all but one of the countries surveyed, the public news organization listed among the eight news outlets receives the highest level of trust. The exception is Spain, where even though a majority trusts the public broadcaster, Televisión Española (TVE), more people trust the private television outlet Antena3. 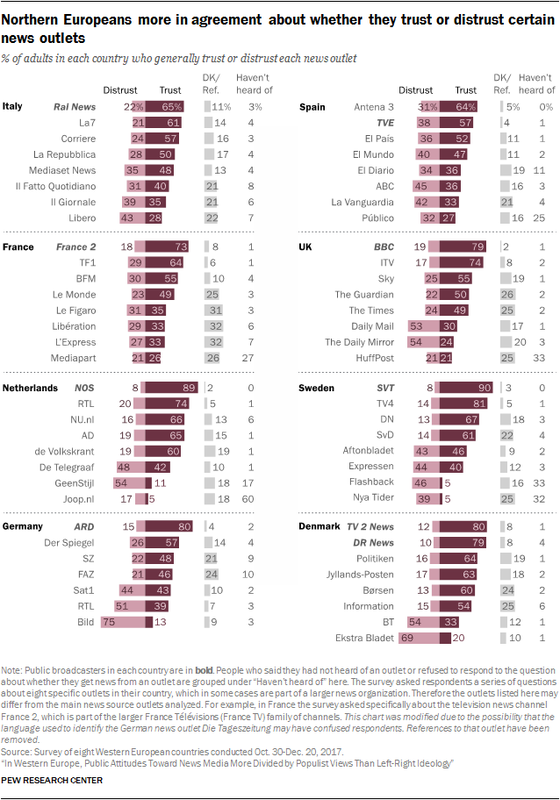 In seven countries, the most trusted outlet is the public news organization, such as Sveriges Television (SVT) in Sweden (90% trust) and Nederlandse Omroep Stichting (NOS) in the Netherlands (89%). Across these seven countries, roughly two-thirds or more say they trust their public news organization. Spain, however, stands apart. While a majority of Spaniards (57%) say they trust the public broadcaster Televisión Española (TVE), 64% say the same about Antena3, a private television station owned by Atresmedia. Private television broadcasters also garner high marks, even if not as high as public news organizations. In seven of the eight countries surveyed, at least half of the public say they trust these outlets, ranging from a high of 81% in Sweden for TV4 to 55% for Sky in the UK. Only in Germany is trust in private television outlets relatively low; roughly four-in-ten Germans say they trust RTL (39%) and Sat1 (43%). Across the eight countries14 surveyed, populist attitudes are strongly associated with trust in specific outlets. For most outlets asked about in each country, those who hold populist views express lower levels of trust than those without populist views. The largest differences occur in Spain, Germany, the UK and the Netherlands, where those with populist views are about 30 percentage points less likely than those with non-populist views to say they trust TVE, Frankfurter Allgemeine Zeitung (FAZ), The Times, and de Volkskrant, respectively. When it comes to public news organizations, Spain stands out as having the largest gap in trust between populists and non-populists (see Appendix D for detailed tables of differences in trust by populist views). The only two outlets of the 64 asked about where populists display significantly higher trust than non-populists are Nya Tider in Sweden (which 4% of Swedes use weekly) and Mediaset News in Italy (which 56% of Italians use weekly). In the five northern countries surveyed, the populist, non-populist divisions in trust are significantly larger than the differences in trust between those on the ideological left and right. Looking at Sweden’s Svenska Dagbladet, for example, there is a gap of 24 percentage points between those who embrace populist views and those who don’t, but only a five-point gap between those on the ideological left and those on the ideological right. In the southern countries, however, trust is divided along the left-right ideological spectrum – ­­ and these differences are as large, or larger, as those based on populism. For example, in Italy, those who place themselves on the left of the 0-to-6 ideological scale are 21 percentage points less likely to trust Il Giornale than people on the right. But for this same outlet, there is no significant division between those with and without populist views.